Looking for an easy-to-use solution suitable for all types of applications? Designed with safety in mind, our BT Levio powered pallet trucks are easy to use and feature an ergonomic tiller arm with fingertip controls. In tight spaces, the truck can be easily manoeuvred using the tiller arm in the upright position (Click-2-Creep). 10 - 12 weeks Free shipping! Ergonomic and intuitive control buttons. All functions can be used with either hand. Standard handle with temporary speed reduction button. The ergonomic handle with intuitive control buttons can be used with either hand, providing excellent control and productivity. The Click-2-Creep feature enables creep travel and also allows you to drive with the steering arm in an upright position. If the truck is left unattended, it will automatically shut off - the time can be set to between 1-20 minutes or 4 hours. The five-wheel chassis design ensures stability: linked side castors protect the wheels and load, which ensures stability on uneven surfaces. A unique combination of contactless controls and CAN-communication ensures excellent driving characteristics and reduced downtime. This feature also provides quick, reliable communication and enables programmability – the truck is adaptable to you and/or your application with 20% less energy consumption. The BT Levio Walkie series suits all types of light-duty applications, such as horizontal transport, loading/unloading and order picking. The trucks are easy to use with the ergonomic tiller arm with fingertip controls, and the Click-2-Creep feature for manoeuvring tight spaces. With BT Powerdrive, excellent truck performance and efficiency are guaranteed. This truck is equipped with telematics hardware, making it a smart truck that can be connected. This allows you to easily monitor its activity and improve its productivity, safety and efficiency. 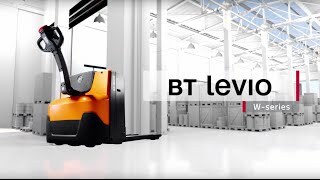 In the BT Levio series there is the option to have a handle which has an integrated temporary speed reduction button, providing you with more accurate operation of the truck in tight spaces.